I will begin this article with some history of my Martial Arts experiences. 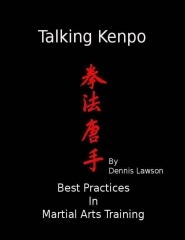 I have studied Ed Parker’s Kenpo for over 15 years. In the early eighties, I boxed for the Highland Town boys club. I studied various traditional Martial Arts in the mid-eighties. Then, I spent over 8 years in the U.S. Army Infantry. Throughout my experiences, I have learned one basic thing about teaching; a student is only as good as his or her instructor’s ability to present information. I have had the pleasure of learning from many talented instructors. Some instructors had the ability to make a 4 our class seem like it was only a 1 hour class. I aspire to this skill level in my own teaching career. My wife and I have owned our Martial Arts studio for over 3 years. I feel I have become a better instructor during that time. When we first started, our classes seemed to go on forever. Now the class is over in a flash. It is one thing for the instructor to feel the class blow by, it is equally important when the student feels this way. We have figured out how to keep the students engaged by teaching in 10 to 15 minute segments. Warm up for 10 to 15 minutes, followed by 10 to 15 minutes on one lesson, then switch the lesson again for 10 to 15 minutes and so forth. This keeps the students from getting lost or confused. We simply keep their bodies and minds moving. Evaluating student progress was the next challenge. I had been looking at our students through “Black Belt Eyes”. I would watch a student’s movement and question why that student was not applying 27 principles of motion or self-defense in each move. In other words, I was expecting the student to perform at a much higher level than the rank he/she was wearing. It took some time for me to internalize the understanding of the principles of motion and self-defense. What I have today is far greater then when I was a yellow belt. The biggest struggle I had to overcome as a teacher was realizing that our students are wearing lower belts for a reason; they haven’t done the work yet. My personal challenge was learning when to keep my mouth shut! I needed to allow the student time to train the lesson. I learned when to coach, and when to move to the next idea. I had to constantly remind myself that it took me 15 years to get the knowledge and the ability to apply it to my personal movement. In any martial art it is easy to watch a yellow or orange belt and think they should be perfect, when you view them with “Black Belt Eyes”. We must realize that we have trained these principles for years and they are internalized. I found it far too easy to forget how I moved as a yellow belt. It is hard to remember where one started; and the years of frustrating and difficult training that made me, and others, the Martial Artists we are today. The skills required to be an instructor are something to be proud of because, like the ranks you wear, you must earn each one. It’s only through consistent effort that one builds the skills it takes to be a good Martial Artist and a competent Instructor. Injuries are a large reason for me to becoming a better instructor. I have suffered several injuries that has side lined me as both a competitor and “hands on” teacher. During this time dealing with injuries, I have learned more about Ed Parker’s Art than ever before. My coach (Dennis Lawson) has developed a specific instructional program that we use in our studio. This program has forced me to learn certain principles in greater depth and has helped me better understand Ed Parker’s Art. These methods presented me with a fresh challenge to effectively teach these more conceptual lessons to our students. My past experiences in some martial arts schools have shown me the importance of a tailored and modern approach to teaching the Martial Arts. I believe that many of my current injuries can be attributed to classical training methods that may have caused much of the damage. This “No Pain, No Gain” mindset was a big part of one of my training experiences. In one dojo when the students lined up and opened class it sounded like a “bubble wrap popping party” or tiny fire crackers going off. I figured out what it was. Those sounds I described were the student’s legs, arms, and backs cracking when we warmed up for training. These classical training methods may have helped me develop arthritis down the road. So, my goals for being a martial arts instructor are simple. First, I want to teach my students how to defend themselves. Secondly, teach them how to train without causing personal injuries to themselves or others. Third, make class lots of fun while giving quality lessons. Fourth, allow the student time to grow by never forgetting where I came from. Fifth, produce good martial artists with a deep understanding of the logic and the principles of our art. Sixth, make sure I have fun, and continue to learn and develop as an artist, an instructor, and as a human being.